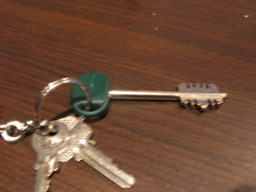 This is a small detail, but funny nonetheless…when is the last time you saw a key that looked like this? Well, that funky green one is the key to my heart apartment. Very modern. How are you doing. Your key looks very funny.